Berbaum Family Farm — Field Level Agriculture, Inc. The Berbaum Family Farm consists of four 40-acre tracts of farmland located south of Loami, Illinois in Sangamon County. Additional details for each tract, including soil maps and aerial photos, can be found below. Download the general brochure HERE. Tract 1 is a good tract of productive prairie soils that is mostly all tillable. There is a small grass waterway in the northeast corner to help with drainage. Drainage appears to be adequate and typical for the area. This farm is an excellent opportunity for to get a top producing farm in a good area. With a soil productivity index rating of 140.9 (144 is max in Sangamon Co.), it is an attractive Class A farm. Click HERE for Tract 1 soil map. Click HERE for Tract 1 aerial photo. Tract 2 is 100% tillable with an overall soil productivity index rating of 136.0. This tract has adequate drainage and is a great farm overall. This high quality 40-acre tract of farmland is in high demand and will not be around long. 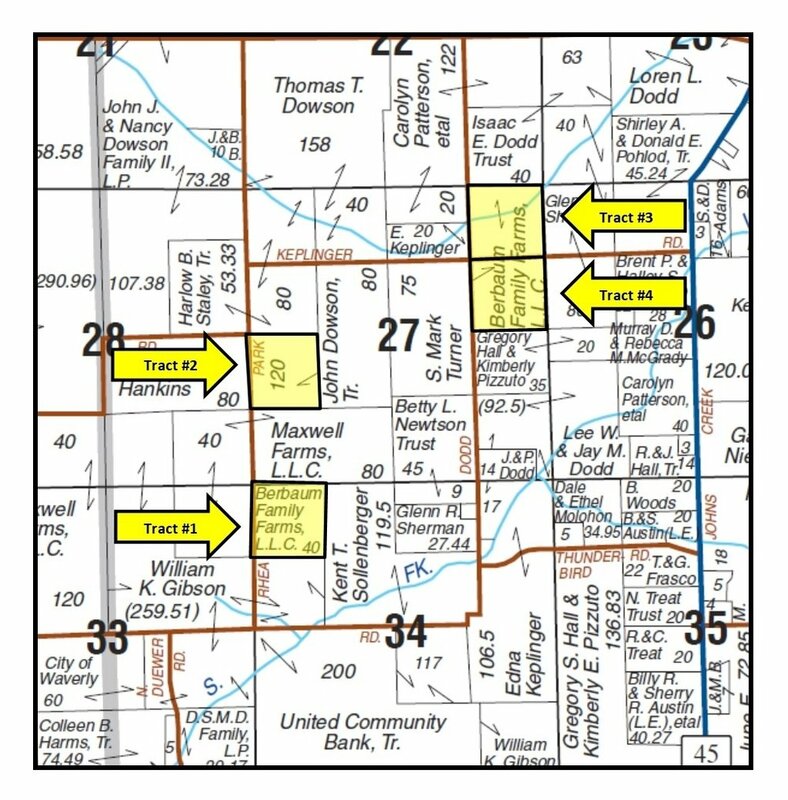 Click HERE for Tract 2 soil map. Click HERE for Tract 2 aerial photo. Tract 3 is 82.2% tillable with an overall soil productivity index rating of 126.6. A drainage ditch runs through the middle of the tract splitting the acreage north to south. This tract would be a good option for an area buyer looking for a place to hunt they can call their own. The trees and ditch running through the property provide a good habitat for wildlife in an area lacking god hunting ground. With tillable acreage to add income, this tract will appeals to hunting enthusiast in the area. Click HERE for Tract 3 soil map. Click HERE for Tract 3 aerial photo. Tract 4 is 93.3% tillable with an overall soil productivity index rating of 132.5.. There is a small grass waterway in the east portion of the farm and there is a treed fence line on the south half of the east border and the east half of the south border. Drainage is adequate and typical for the area. Click HERE for Tract 4 soil map. Click HERE for Tract 4 aerial photo. Tract 1 from the southwest corner looking to the northeast. Tract 1 from the northwest corner looking to the southeast. Tract 2 from the northwest corner looking to the southeast. Tract 3 from the southeast looking to the west. Tract 4 from the southwest corner looking to the north. Tract 2 from the west looking to the east. Tract 3 from the southwest corner looking to the northeast. Tract 4 from the northeast corner looking to the southwest.